This Spring Oh So Arty was invited by Petrohradská Kolektiv and the Czech Center Tel Aviv to visit Prague and explore the city’s unique art scene. Our hosts took us to contemporary galleries, major museums, adorable coffee shops and chic cocktail bars. We have compiled our favorite insider destinations in Prague in this article guide to inspire your future arty travels. Our first stop was the Petrohradská Kolektiv, an artist run art center that offers artist-in-residence programs for 12 artists as well as studio space and housing accommodations. Established in 2016 in a former chocolate factory this cultural hub is nothing short of amazing. Petrohradská hosts 60 Czech artists and 12 foreign artists every year. They host a Live Art Program in the Petrohradská Room where you can catch alternative concerts and more. Make sure to visit the buildings spacious rooftop when you are there as well! Petrohradská Kolektiv with a work by Klone Yourself. After meeting with both Czech and international artists at Petrohradská Kolektiv we were ready to eat! We had our first of many delicious meals at Madame Lyn Restaurant. Opened in 2013 Madame Lyn is one of the first Vietnamese restaurants in Prague. Offering delicious food, nice wines and an outdoor garden space this restaurant is worth a visit. Exhausted from traveling we went to bed early and prepared for another arty day around Prague. Day two’s excursions were all about galleries! We visited four Prague galleries: Svit Gallery, Nevan Contemporary, Hunt Kastner and Polansky Gallery. Hunt Kastner is located on the hip Borivojova Street which also has other galleries, design shops, bars and clubs. If you find yourself on Borivojova Street Oh So Arty Prague insider, Martina Freitagová recommends stopping for drinks at Bukowski’s Bar and shopping the sustainable designs at Playbag. The next morning began with coffee at Cafe Savoy. The restaurant’s design evokes a vintage feeling harking back to the First Czechoslovakian Republic. Make sure to look up and enjoy the Neo-Renaissance ceiling dating back to 1893 as you enjoy fresh bakery products. Next we visited the National Gallery in Prague which has an impressive and encyclopedic permanent collection as well exciting rotating contemporary art exhibitions. 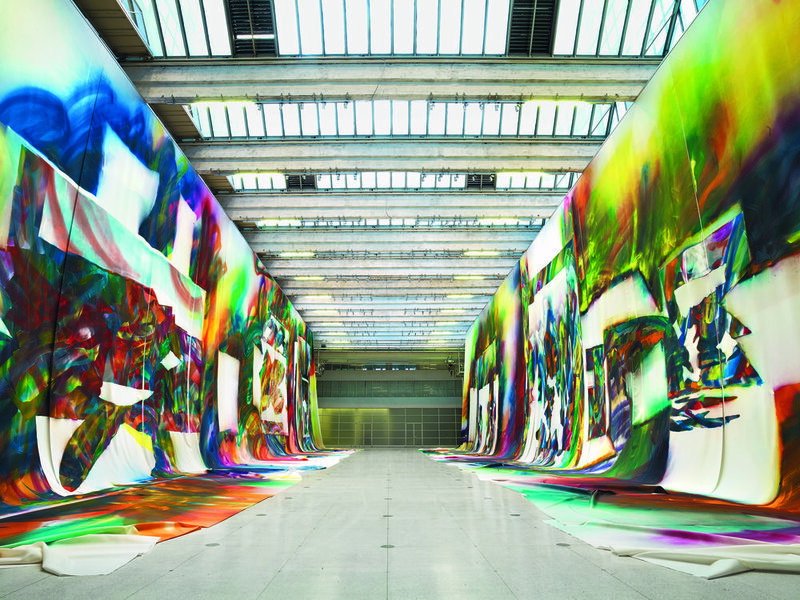 We were lucky enough to see Katharina Grosse’s installation ‘Wunderbild’, which in itself made the trip to the museum worthwhile. It is on view at the National Gallery in Prague until January 2019 and we cannot recommend it enough. After thoroughly enjoying the art offered by the National Gallery we decided to stop by its restaurant, Cafe Jedna where we treated ourselves to coffee and pastries. At the recommendation of local Oh So Arty guide Martina we then visited Meet Factory, a cultural hub offering everything from exhibitions, music, theater, dance, and cool gigs. It was clear to that us that there is always something going on at Meet Factory. Then we took a walk through the old town of Prague to enjoy its historical charm. If you’re looking for a hotel in the city we recommend the Hotel Palace Praha located within walking distance of the famous astronomical clock. A member of Leading Hotels of the World this luxury hotel is housed in a majestic art nouveau building that has been operating since 1909. Photo courtesy of the Hotel Palace Prague. To celebrate our last evening in Prague we visited Bar Cobra. Located in the Holešovice/Letná district, Bar Cobra offers great drinks, music, and vibes. If you’re interested in exploring Prague like an Oh So Arty insider visit our guide Martina Freitagová's profile here. To read our 72 hour city guide of Madrid click here.